Learn the Tips, Tricks, and Tools of Trade Guaranteed to Take Your Marketing to the Next Level! 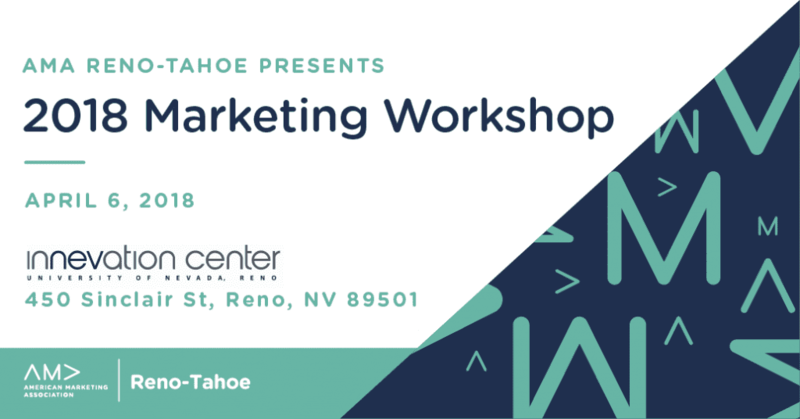 Join the Reno Tahoe American Marketing Association for our Sixth Annual Marketing Workshop, where you will learn from some of the brightest minds in the industry. Whether you’re just getting started, or are a seasoned marketing professional, there is a session for you! This workshop will feature speakers from varying backgrounds to help you expand your knowledge and leave with key takeaways to implement at your business and help grow your presence. Come join us for a day full of learning on Friday, April 6th from 10am – 4pm. On April 6th, you will enjoy incredible speakers covering an array of topics. We will be offering interactive sessions moderated by local professionals called, Loud Tables, where attendees will brainstorm/collaborate/share the tips, tricks, and tools they use. R. Bret Leary is an Assistant Professor of Marketing at the University of Nevada, Reno. His research focuses on consumer well-being and the motivations behind ethical and sustainable behavior in the marketplace. He specifically focuses on perceptions of marketplace influence and risk decision-making. He teaches marketing strategy and management at both the undergraduate and graduate levels at UNR. A regional expert in social media, Caren Roblin is Sierra Nevada Media Group’s director of content. She works with several newsrooms around Northern Nevada on social media best practices, transitioning into a “newsroom of the future” mindset and the creation of new online products, such as FoodLore. Prior to SNMG, Caren worked in several positions at the Reno Gazette-Journal over 11 years, including audience analyst, digital editor and social media manager. She leads the Online News Association local chapter in Reno (ONA Reno), serves on the Reynolds School of Journalism Dean’s Advisory Council at the University of Nevada, Reno, and regularly mentors journalism students. Discussion Moderator – Katie Silva, Peppermill Resort Spa Casino (Casinos Inc.). Katie is the Corporate Communications Manager for Peppermill Resorts Inc. She is an accomplished marketing professional with over 12 years of experience in internet marketing, advertising, social media, and public relations. After receiving her B.A. in journalism from San Diego State University, Katie soon found her niche in the hospitality industry. Her past positions have included marketing for the prominent La Jolla Beach and Tennis Club, and the San Diego Tourism Authority. Angela joined the SPCA’s development team in October of 2016. Before coming to the SPCA, Angela worked primarily in marketing and education; she is proud to have a BA in Psychology from the University of Nevada and a Social Media Marketing Certificate from UNR’s Extended Studies. She is currently pursuing a Master’s of Business Administration from the University of Nevada. Brittany has experience in many facets of marketing, including app marketing, mobile marketing, brand management, web design, brand strategy, integrated marketing campaigns, event marketing, and more. She is currently the Marketing Manager for Ruby Seven Studios, an app development company on the cutting edge of mobile marketing. Originally from Toronto, Canada, Brittany attended the University of Nevada, Reno for Business and graduated with a degree in Marketing and Management. Brittany is currently pursuing her Master’s in Business Administration and lives in Reno, Nevada. A University of Nevada, Reno, graduate and Nevada native, Erin is the Client Engagement Specialist at Noble Studios. In her role, she works with potential clients to assess services to match client’s digital marketing needs and collaborates with Noble’s internal teams to create strategies that demonstrate the positive impact. She is passionate about web community development, marketing, and nonprofit work and will be acting as emcee for our event. We will be offering interactive sessions moderated by local professionals called, Loud Tables, where attendees will brainstorm/collaborate/share the tips, tricks, and tools they use.